Give your practice a competitive edge with an ESI all-in-one digital phone system. This is a business phone system to you will actually enjoy using! 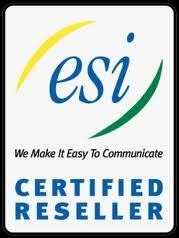 ESI's Business Class System is especially designed to improve your communication and increase your productivity. ESI has all the features you need, and counting. Voice mail - ESI's sixth-generation voice mail features a dedicated mailbox for each station and an automated attendant. The automated attendant provides up to 18 branches that conveniently route callers to their desired extensions or departments, or even destinations outsite the system. Integrated Answering Machine - The system can simultaneously record two messages using any of the available lines. Messages are accessible from any designated station, and the provided 30 minutes of storage is more than on any conventional answering machine. Advanced voice mail and answering machine features - Live call screening, off-premises "reach-me", external message notification, and a Message Recycle Bin. Intelligent Caller ID - See at a glance who's calling (or who's on call-waiting). ESI's patented technology even stores caller information for callback at anytime. Additionally, your ESI phone system uses incoming calls' Caller ID information to reset its clock automatically for maximum accuracy. (That's the same method a cell phone uses to keep accurate time.) Of course, you can still set the clock manually if you wish. Spoken Help - Need assistance using your phone? Just press the HELP key for the friendly Verbal User Guide. The built-in user tutorial simplifies training new employees and makes it unnecessary to keep track of a printed manual. Unique message handling - With ESI's patented features, sharing information with your team is a snap. ESI's Quick Groups lets you send a message to other user mailboxes by pressing the blue Voice Mail key followed by the desired station keys - easily creating a voice mail distribution group on the fly. Message Recycle Bin - The system stores as many as 10 of your most recently deleted messages in a Message Recycle Bin from which you can easily recover them. External Call Forwarding - ESI lets you forward an outside call directly to a cellular phone, branch office, or answering machine. Call Recording - ESI lets you record any call. Simply press the RECORD key on your ESI desktop phone and the system will record the call - even conference calls and personal reminders. Call Screening - Screen calls just as you do with home answering machines. Listen as callers leave messages in your mailbox, and intercept a call by lifting the handset. Built-in Music-On-Hold - For those times when your callers are on hold, ESI includes three pre-recorded music tracks to save you licensing fees. If you prefer an existing audio source, just plug it into the convenient jack on the system cabinet. Grows With Your Business - ESI easily expands from four incoming lines, eight digital stations and two analog ports to 16 lines, 32 digital stations, and 8 analog ports. Easy, secure maintenance and updates - Perform system maintenance via modem, direct connection, or the LAN/WAN. Your system administrator (or authorized personnel) can also use convenient ESI software to manage system settings. System updates are easily accomplished through software downloads. ESI systems are fully self-contained, for higher reliability and more security.